Missed the last newsletter? Check it out here. Or sign up by visiting our home page. How many times have you sent email after email only lose track of the messages you sent? Does your inbox feel cluttered and you’re searching between Dropbox, several different emails, and who knows what else for information about a certain project and client? Email folders help but there is still quite a bit of digging involved… Well, there is a fix! We keep our threads extremely organized in this super easy way! Go to slack.com and join! 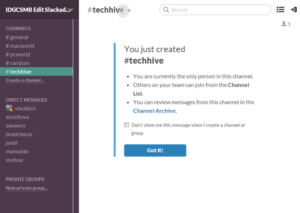 When we begin a new project, we create a “Channel” in Slack according to the name of the website. If someone on our team has a question about a certain account, the message goes in the corresponding channel. Sometimes we even invite the client to join the Slack channel so they can see all the messages being sent and information being shared. We even pin our info.txt file holding all of the usernames and passwords for that account so we can easily access any information we need. Whether you’re working on a team of 20 or just by yourself, organizing notes, files, communication, and everything else into very neatly labeled threads keeps our productivity at optimum!